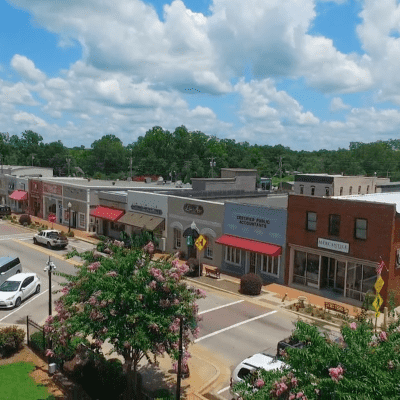 This small town located in Henry County is moving towards the future while keeping their roots in the past. Hampton features a mix of old and new with a repurposed cotton mill and historic retail stores on Cherry Street being utilized now as lofts and townhomes. Hampton was established in 1873. Originally known as “Bear Creek” for the creek that runs through the area, the name was changed to reflect its namesake, Brig. General Wade Hampton that same year. As with most cities in Atlanta, the railroad brought prosperity to the town. In 1960, the Atlanta Motor Speedway was built in the city and brought with it continued visitors and development to the area. The Atlanta Motor Speedway is a 1.54-mile racetrack incredibly popular with NASCAR racing enthusiasts. The venue can seat 125,000 spectators. After a track renovation in 1997, Atlanta Motor Speedway is now one of the fastest tracks on the NASCAR circuit. For those that want to take to the track, there are also exotic driving events offered regularly so you can get behind the wheel of a Ferrari on the track.